It’s been a busy month around the old ireadiwrite homestead – we’ve launched two of our books in print and getting ready for a third. But I remain true to my first love – digital publishing – and am so pleased to present a wonderful piece of science fiction – WE’VE SEEN THE ENEMY by Paul Dayton. Paul is a fellow Canadian and he’s written a fast-paced and action-packed story that appeals not only to sci-fi lovers but women and men alike by including strong female characters and unassuming male heroes. Paul’s use of technology and science is well researched and the book transports us from one group of heroes to another in each chapter – creating suspense along the way and making it impossible to put down. I particularly liked the ending – which isn’t one at all – but is a “to-be-continued” keeping me on the edge of my seat until the new and final book is available later this spring. Oh, and by the way, it’s our featured book for the next few weeks – so come and check it out while it’s only $3.99. Well done Paul and welcome to the family! WE’VE SEEN THE ENEMY is set 700 years after the Great War and is a desperate race by a suicide team that may finally lead to the end of this interstellar war. Meanwhile, pockets of left-over human tribes on Earth have their own struggles, as they face power-hungry dictators and warped religious leaders. Behind all this are multiple alien forces, each with their own agenda. As truths turn into lies and friends become enemies, can humanity unite together to fight their common enemy? 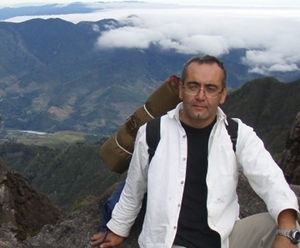 Paul Dayton is an adventurer, traveler and volunteer. When he’s not writing or reading the works of Isaac Asimov and Arthur C. Clarke, you’ll find him on a motorcycle, bike or at the top of a mountain. Just a little word to thank all the folks who supported the ireadiwrite authors by buying their books during this year’s Read an Ebook Week. It was tremendously successful, and your support is greatly appreciated. We’ve decided to keep the momentum going by featuring one of our books each week on our front page. When we have a new release, that book will get the front page, but on other weeks, we’ll select a book and put it up half price and offer a bit more information on the story, the author or perhaps a bit on how we came to publish it. ireadiwrite Publishing is proud to be partners with Read an eBook Week; this year being held from Sunday, March 7 to Saturday, March 13. It is organized by Rita Toews, an author and avid ebook advocate; and sponsored by all the major booksellers and digital publishers. You can find out more about her and the event at http://ebookweek.com. We may add more books to this schedule, but we’ll keep you posted.